Solihull Medical Cosmetic Clinic, under the supervision of Dr Sagoo, is proud to be the first clinic in the UK to offer the FRX Fractional CO2 Skin resurfacing laser. The CO2 laser remains the superior tool for aesthetic skin resurfacing, a procedure designed to remove superficial wrinkles around the eyes, lips, forehead and cheeks, which are so often apparent in ageing skin. Patients with facial acne scars, enlarged pores, or sun-damaged skin with uneven pigmentation can also make excellent candidates for this treatment. Fractional Skin Resurfacing causes tiny dot (or pixel-like) damage to treated areas in the skin, leaving most of the surrounding skin intact. New collagen may be produced from the injury to the dermis, which can help to reduce the appearance of lines, scarring and acne. Fractional Skin Resurfacing may allow the skin to heal more quickly than if the whole area was treated, as the healthy, untreated tissue acts as a natural bandage whilst the treated area heals. Patients generally feel a burning sensation on the skin immediately after the treatment, which may last one to four hours. There is a down time of about four to five days, and after this you are pinkish/red. The skin may continue to produce collagen for up to six months and the skin may appear rejuvenated – bye-bye wrinkles! Improvements may be seen with every treatment depending upon the amount of correction required. Approximately two to three treatments are required monthly. Optimum improvement after Fractional Skin Resurfacing is usually at around three months, as collagen remodeling and skin tightening may continue for this period. Fine lines and wrinkles around the eyes and mouth as well as brown spots may be removed or reduced, and deeper frown lines and grooves may be greatly softened. Large pores may be reduced in size, and your overall skin texture and appearance may be firmer and tighter. Once the outer layer of skin has been partially removed, the new skin underneath may present a softer, smoother, more youthful appearance. The message from our many happy patients is that less than an hour with the fractional laser can erase up to ten years from your face. Many of our patients have reported that Fractional Skin Resurfacing is an exceptional treatment for sun damaged lines, wrinkles and for skin tightening. If you would like like to achieve a quick and visible improvement in wrinkles and skin sagging, then Fractional Skin Resurfacing may be the treatment option for you. 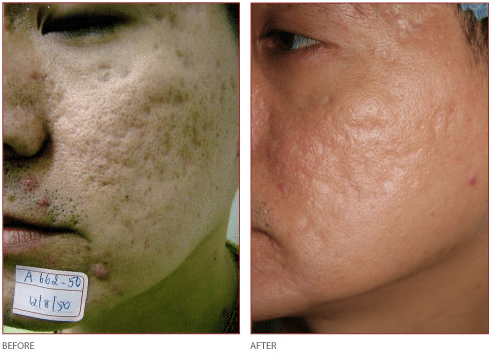 Fractional skin resurfacing can be an excellent treatment for moderate to severe acne and acne scarring. It may be effective in improving skin texture and depressed acne scarring with reduced down time when other treatments have failed. It is safe and effective for many conditions, and may help with sun damage, stubborn pigmentation, acne scars, rough texture, enlarged pores, fine lines, wrinkles and skin laxity in the face, neck, chest, arms, and hands and surgical scars, with minimal downtime. Here are some of the conditions that may be improved with fractional skin resurfacing. For further information on this exclusive procedure please book a full assessment with Dr. Sagoo on 0845 603 6150.